We offer a wide range of Mental Health Services to our community. We are a mental health Center serving the Children and Families of Palm Beach County for more than 20 years, we are committed to improving the quality of life and level of performance of emotionally and behaviorally challenged children and their families, through an array of diverse services. Here at MPCI, we have the mission and motivation of helping through diversity with cultural respect and sensitivity, while striving to achieve the highest standard of mental and behavioral health care. We have put together a well-trained staff of professionals, specializing in children and families. Most of them are Florida Board licensed, fluent in more than one language, culturally competent, and have vast experience in working with different world cultures. We have put together a well trained staff of professionals, specializing in children and families who make a difference in our community. Multilingual Psychotherapy Centers, Inc.’s vision is to expand its mental health services to all the different cultural groups established in the State of Florida, always in their own language. 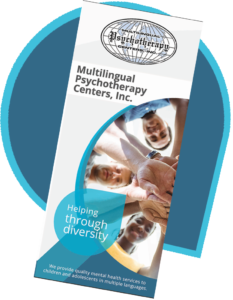 Multilingual Psychotherapy Centers, Inc. recognizes as its mission to improve the lives of children and families through their diversity, that is, considering their cultural backgrounds, speaking their own language, providing the mental health services they need both in-office or on-site, that is, going to homes, shelters, schools, or others. We trust in the professionalism and quality of our service providers. 1. We believe that every single culture deserves the same respect and consideration. 2. We believe the diversity of people in Florida enriches our State. 3. We believe that improving the lives of children and families is basic for the future of a healthy society. Get the latest news and events sent to your email.